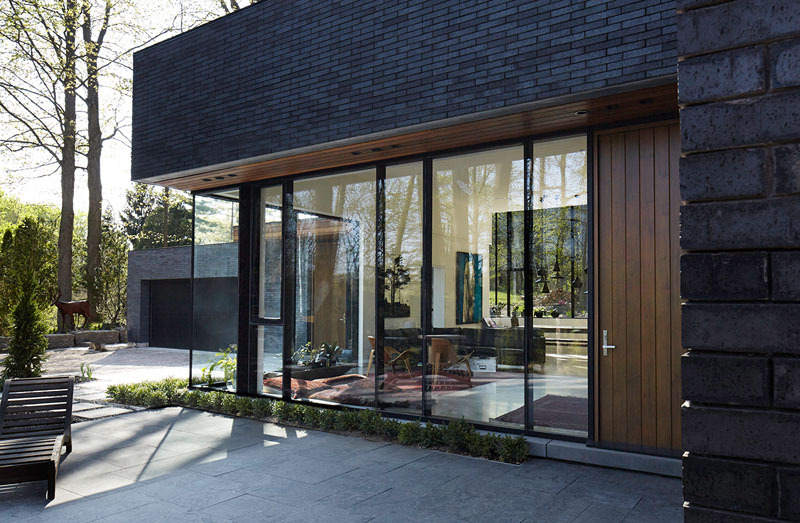 A home with a combination of wood and dark bricks in the exterior. Wouldn’t it be nice to live in the forest and be like Snow White or Aurora as you venture into the woods with cute animals and all the beauty of nature? Well, I am sure of nature’s beauty around it but not of the animals because not all forests actually have animals in them these days especially if there are many residents in it. But it would be awesome to live around trees and bushes. Maybe you’d even feel like Bella Swan because of the location. I am sure you can remember how the Cullen’s home looks like and how it is surrounded with trees. The house we will feature today may not look like it but it looks really nice with its finish and design and location. What we will feature today is the Fallsview Residence in Dundas, Ontario, Canada that has dark brick exterior which gave the home more life for itself in the forest. 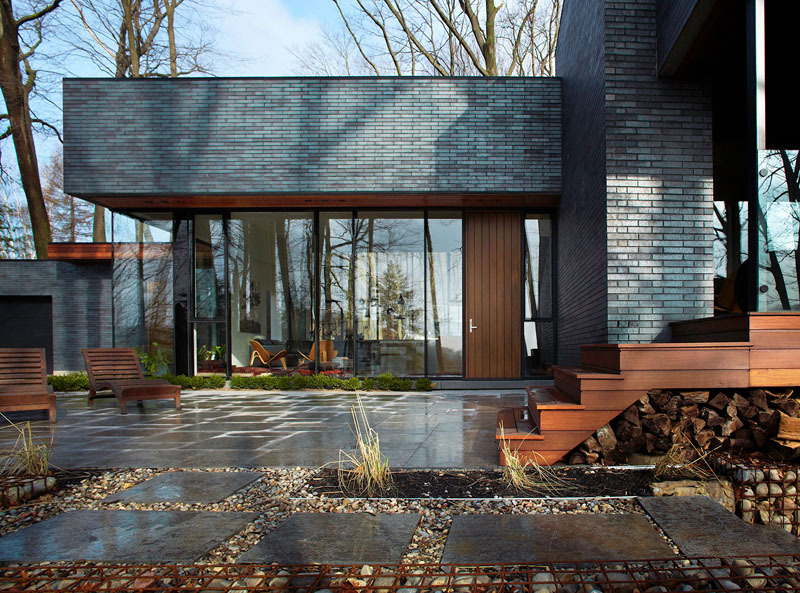 Designed by Setless Architecture, the house which sits above the Bruce Trail, on the edge of the Niagara Escarpment – a UNESCO World Biosphere Reserve, has a contemporary design using a combination of bricks and wood for the exterior. Meanwhile, it has a nice interior design as it used white for the walls and flooring with some wooden elements around it. But what is really good about the home is its outdoor area. Aside from the trees, the outdoor space is well landscaped which will help the owners to enjoy the outdoors even more. Unique feature: A contemporary home in the forest featuring dark brick exterior. Gorgeous. Because of the dark brick walls, the house seems to blend with nature around it. You can also see that trees around the house make the area look even more beautiful. It is like you will always be on a retreat when you are here! On one side of the house, you can see the garage with a black door and you can also see here how neat and nice the outdoor space is as the designers added pavers on the ground on some areas around the house. It also looks like they preserved some trees too. This dark brick and wood home has an outdoor patio with its own dining area and outdoor lounge. Aside from the trees, there are also some other types of plants n it and even large rocks. This area can been seen from indoors through the large black-framed windows. By using touches of wood, the dark brick exterior is softened with the added glass walls in it. Aside from that, there are also other wooden features like the chairs, stairs, and door. You can also see in this picture that concrete pavers were added in the outdoor area. Large windows allow plenty of light into the interior living areas and it also allows the owners to get a nice view of the surroundings. Oh, I spotted a deer in this photo. I’m not sure if its real or just a sculpture that they added there. But it would be totally cool if that one is real! In the interior, there is a cozy living room with fireplace that can be extended by opening the space to the covered deck area. This part of the house looks really cozy because aside from being able to seamlessly connect to the deck, the furniture used in here are really beautiful and are made of natural materials like the wicker set and wooden table. This is the second living area featuring contemporary furniture in it. The white walls are broken up with windows that have a view of the surrounding trees. With the glass windows, this part of the house is flooded with natural light. And I can see the deer again. Hmmm… It must be a sculpture! One would walk through a floating teak walkway in order to get to the living room. I like the combination of glass walls and a wooden door in here. Another interesting feature in the living room is the trunk coffee tables! Didn’t know that these were suitcases until I saw the handles. This is the kitchen, with plenty of storage that used wood. Notice that it used two different tones of wood for the island and the cabinets. One thing that is noticeable here is the cut-out section for displaying artwork. Very interesting, right? Even its lighting looks unique as well. The bedroom has a wood covered feature wall that takes inspiration from the surrounding trees. It also has a bed made of wood and a comfy mattress on it. You can also see that it has glass pendant lights suspended from the ceiling. Like the living area, this one also has floor-to-ceiling glass windows in it. What can you say? This looks very nice, right? I like it that the design is simple but sophisticated both in the interior and the exterior of the house. This home designed by Setless Architecture is indeed a wonder in the forest. And I like how everything is designed with a contemporary and modern combination. All in all, this is one house that I would like to own. It’s just neat and does not have too many details on it that may look exaggerated or would crowd the house. I like it that there are plenty of negative spaces to give the furniture area to breathe and to make access and traffic easier. But that didn’t make the house look boring after all.